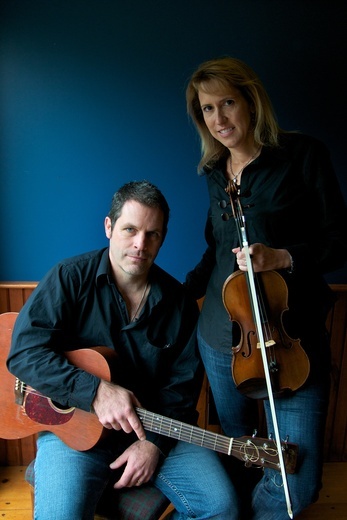 "Guitarist & Singer Sean Brennan, and Fiddler Nikki Engstrom, have created something very special with their latest CD "Another Round." This New England duo plays a mix of old and new tunes that is a delight to the ears and addicting to the feet (especial those that dance). We at Celtic Radio carefully listened to each and every track on this CD and we have come to the conclusion that perfection has been made! Every musical measure is a beautiful display of just how much these folks love to play. Some of our favorite tracks include Pachabel's Frolics - a fast, toe tapping journey into fiddle and guitar euphoria mixed every so often with a few slower classical measures - just exhilarating! Fiddler's Green is sung by Sean's strong and warm vocals showing that this group is not just about Jigs & Reels, but has the depth and talent to shine with many different types of Celtic music. Mike Ryan's Lament, one of our favorites, is a post Civil War song about the legendary 7th_Calvary and Custer's defeat at the Battle of the Little Bighorn. Sean brings this song to life about the tragic tale of two brothers who left Ireland for the idea of America, only to meet their end at Vicksburg and Little Big Horn. A song only made possible by the emotional stirring of Nikki's fiddle and Sean's vocals - clearly both playing off each other’s talent making for a wonderful rendition of this ageless song.